More than a decade into the 21st century, the health community is grappling with epidemiological and demographic transitions. In this regard, noncommunicable diseases (NCDs) have overtaken infectious diseases as the leading cause of mortality globally. This shift challenges traditional development thinking, which has long focused primarily on infectious diseases and maternal and child mortality as priorities for international actions. While continuing to combat infectious diseases and maternal and child conditions, the world needs to address the emerging NCD challenges. Besides, it is imperative to explore and analyze why we still make a slow progress in addressing NCDs despite a number of global and national commitments. NCDs, which include cardiovascular diseases (CVD), cancer, diabetes and chronic respiratory diseases, are the leading cause of death and a prominent cause of disability worldwide, accounting for more than 36 million lives lost each year and 15 million premature deaths. Moreover, around 70% of the world’s poor now live in low and middle-income countries, where economic growth and modernization have opened wide the entry point for the spread of unhealthy lifestyles. Evidence confirms that the majority of the health burden from NCDs are attributable from four major behavioral risks including, but not limited to, unhealthy diet, tobacco use, harmful use of alcohol and physical inactivity. Most of the aforementioned risks are preventable. High blood pressure accounts for more than 7.5 million deaths annually. The second leading cause of NCDs is tobacco use, which contributes to 5.1 million deaths each year, followed by high blood glucose (3.4 million deaths). Apart from the Big Four Diseases and Big Four Risks, mental neurological and substance use disorders and malnutrition in all forms also contribute to the huge health burden worldwide. Thus NCDs can no longer be conceptualized as a rich-country problem. WHO estimates that 80% of the burden from NCDs now falls on low- and middle-income countries, where people develop these diseases earlier, fall sicker, and unfortunately die sooner than their counterparts in wealthy nations. NCDs have been recognized as a public health catastrophe, not only for human health, but also in the economic arena due to premature mortality which leads to lost productivity and endangers industry competitiveness across borders. The World Economic Forum highlighted that NCDs may contribute to over US$ 30 trillion economic loss in the next 20 years, equivalent to approximately half of the global gross domestic products (GDPs) in 2010. Besides, there has been a concern amongst economic experts worldwide that NCDs will undermine not only the global GDP in monetary values but also labor supply and capital accumulation. Though, currently the burden of NCDs is borne mostly by high income countries, the NCD prevalence increases in leaps and bounds in LMICs due to steep economic and population growth. From a societal perspective, it positions these diseases as one of the major challenges for development in the 21st century. It points out their threat to economies and their contribution to inequalities. Some NCDs, such as cancer and end stage renal diseases, are major contributory factors of household impoverishment. The responsibility for the rise in NCDs does not fall on individuals who choose to eat, smoke, and drink too much or opt for a sedentary lifestyle. The responsibility falls on the environments in which these choices are made and we should call for the whole society including governments, civil societies and private sectors to be responsible for building healthy environments and making choice architectures for good health. Year 2011 marks a historic event when the UN General Assembly passed the Political Declaration on NCD prevention and control, reiterating the significance of NCD programs and the role of multiple stakeholders beyond the health sector. The issue of NCDs is the second health agenda after HIV/AIDS which was proposed into the UNGA High Level Meeting in 2011. Since then, WHO Regional Offices have been working with Member states to provide technical services and other support to accelerate implementation of the GAP on NCDs and these best buys in the member states, but the progress remains uneven. In 2015, the global community has again reaffirmed the commitment of tackling NCDs, mental health and nutrition problems through the adoption of the Sustainable Development Goals. The sustainable development agenda covers the targets and indicators on reduction of premature mortality from NCDs, hunger and malnutrition, mental health and substance abuse. It has proven that tackling NCDs needs united efforts from the whole of government through effective multi-sectoral actions. Focusing on both processes and outcomes, the SDGs reaffirm commitment and provide guidance and monitoring framework for NCD prevention and control programs, at both national and international levels. These SDG goals and targets particularly relate to NCDs, mental health and nutrition. Universal Health Coverage (UHC), identified as target SDG 3.8, is both the goal and means by itself. UHC is particularly crucial for the management of NCDs, nutrition and mental health, in particular for health system responses. Not only screening, diagnosis and treatment, UHC also contributes to disease prevention and health promotion. Scaling up implementation of NCD best buy interventions is therefore clearly part of the path towards UHC. UNGA resolution requests the WHO Director-General to report back to the UNGA HLM in 2018. Not unsurprisingly, most of the UN Member States are off track towards NCD achievement. Failure to address NCD primary preventions beyond health sector. It must stress the need for policy solutions that shape social environments and these are the responsibility of all partners, not only the governments. Lost sight to tackle the commercial determinants, in particular by tobacco, alcohol and obesogenic food industries, and spread too thin on risk factors, focused too much on treatment rather than prevention. Health system has not yet been prepared for NCDs and chronic care, with large know-do gaps to implement the “best buy” interventions mostly beyond the health sector capacities. 4. Large gaps of citizens’ capacity to hold government accountable to NCD primary prevention; yet to improve the accountability across international and national partners and united efforts across different sectoral partners in tackling NCDs. As we approach the deadline to achieve the targets in 2025, it is important to take stock of the situation and collectively share the experiences and discuss on how to accelerate the progress. Thus the PMAC in January 2019 would be most timely to bring up the UN HLM report in 2018 and recommend further actions to make the efforts to prevent and control NCDs back on track. To sustain global movement towards, and collaborations on the implementation of NCD prevention measures in particular the best buy long-term interventions. To brainstorm on the way forward after the 2018 UN HLM in implementing effective NCD prevention and control in particular the commercial determinants, health system preparedness and accountability and monitoring framework. To share knowledge, context-relevant experience, and viewpoints of international organizations and countries working towards prevention and control of NCDs. To provide a platform where policymakers, policy analysts, researchers, academics, representatives from development partners and all relevant stakeholders can learn from, and help strengthen capacity of, each other in the way that links to NCD prevention and control in the context of UHC. To promote intra-and inter-national collaborations amongst stakeholders. The target audience includes policymakers, senior officers, and staff of national bodies that are responsible for the decisions of resource allocation in NCDs including the Ministry of Finance, Ministry of Health and other relevant agencies, HTA agencies, civil society organizations, international organizations and development partners, universities, and industries. Background Noncommunicable diseases (NCDs), such as cardiovascular diseases, cancer, chronic obstructive pulmonary disease, diabetes and mental illnesses are the leading causes of morbidity and mortality, claiming 40 million out of 56 million annual deaths globally. 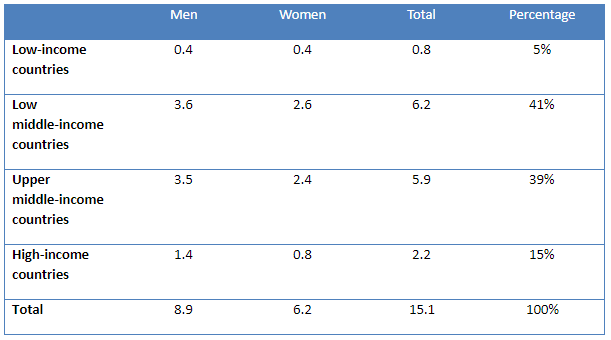 The four main categories of NCDs are commonly grouped together due to their shared risk factors, such as tobacco use, unhealthy diets, physical inactivity and harmful use of alcohol (Table 1). Over the past decade, evidence has also accumulated on the role that social contexts play in determining the health and well-being of people regarding NCDs. The social determinants of health are defined as the “causes of the causes” or “societal conditions in which people are born, grow, live, work and age,” and they show a clear social gradient in health outcomes (WHO 2008). Two important meetings held in 2011 – the UN High Level Meeting on the Prevention and Control of NCDs in New York, and a thematically linked World Conference on Social Determinants of Health in Rio de Janeiro, Brazil – reaffirmed the role of social determinants in health and disease. More importantly, effective and accessible health systems were also recognized as a social determinant of health and as a driver of health inequities. In 2014 the second UN high level meeting on NCDs was held, and a set of time bound commitments and 10 process monitoring indicators was adopted.3 In 2015, the Sustainable Development Goals included a target (3.4) to reduce premature NCD mortality by one third by 2030 through prevention and treatment and promoting mental health and well-being.4 The 2030 Agenda provided valuable guidance to all countries to address the three dimensions of sustainable development – economic, social and environmental. However, the SDGs cannot be achieved without addressing the growing burden of NCDs, as they will undermine the achievements of other SDGs, such as, for example, poverty eradication. To prevent premature mortality and morbidity from NCDs, a life-course approach is required, as younger generations globally are exposed to a range of risk factors and suffer from a variety of NCDs. Focus on children and adolescents, particularly curbing childhood obesity, is important for building a strong foundation for achieving SDGs and SDG3.4. Key risk factors of NCDs are strongly associated with patterns of consumption and unhealthy choices that are often influenced by the corporate sector. The commercial determinants of health, defined as “strategies and approaches used by the private sector to promote products and choices that are detrimental to health,” need to be addressed to focus the fights against NCD risk factors. However, the private sector is not homogeneous, and governments can and should incentivize the private sector to align their practices to national public health goals, while avoiding potential real or perceived conflicts of interest. Effective NCD prevention and control requires multisectoral (health, agriculture, communication, education, employment, energy, environment, finance, food systems, foreign affairs, housing, justice and security, legislature, social welfare, social and economic development, environment, sports, trade and industry, transport, urban planning and youth affairs) and coordinated multistakeholder (governments and non-State actors) engagement. Policy coherence is critical to ensuring an integrated response to NCD risk factors and goes beyond the responsibility of one line ministry. For example, the FCTC can be viewed as best practice to promote policy coherence across multiple policy domains relevant to tobacco control. Meeting the SDG FCT target (3a, Strengthen the implementation of the WHO Framework Convention on Tobacco Control in all countries, as appropriate) will be one of the most important contributors to achieving SDG 3.4. In an era of growing healthcare expenditure and fiscal restraint, governments are exploring ways of limiting spending on social sectors, including health. Hence, arguments for prevention based on economic benefits are more likely to appeal to policy-makers and international funders. Multisectoral action for prevention will be necessary to reduce the future burden, in addition to action in the health sector, particularly at the primary level of care. In May 2015, the World Health Organization published a report on how WHO would report to the United Nations General Assembly in 2017 on the progress achieved in the implementation of national commitments included in the 2011 UN Political Declaration and the 2014 UN Outcome Document on NCDs. The Technical Note (NCD Progress Monitor) was updated in September 2017 to ensure alignment with the updated set of WHO ‘best-buys’ and other recommended interventions for the prevention and control of noncommunicable diseases, which were endorsed by the World Health Assembly in May 2017. The Progress Monitor provides data on the 19 indicators detailed in the Technical Note for all of WHO’s 194 Member States. The indicators include setting time-bound targets to reduce NCD deaths; developing whole-of-government policies to address NCDs; implementing key tobacco demand reduction measures; measures to reduce harmful use of alcohol and unhealthy diets and promote physical activity; and strengthening health systems through primary health care and universal health coverage. Continued neglect of NCDs is a result of political neglect. The availability of scientific evidence and cost-effective interventions is not a guarantee of effective national responses. Applying a political economy lens to understanding various policy contexts, including the priorities of particular administrations, power relations and vested interests, is important to understanding the political forces and incentives for incorporating NCDs into the development agenda and the allocation of funding for international development and global health. 1 WHO World Health Statistics 2017: monitoring health for the SDGs. Geneva: World Health Organization;2017. 3 WHO. Noncommunicable Diseases Progress Monitor 2015. Geneva: World Health Organization, 2015. 4 UN. Sustainable Development Goals: United Nations; 2015 [cited 2016 June]. Available from: https://sustainabledevelopment.un.org/?menu=1300. 5 WHO. Noncommunicable Diseases Progress Monitor 2017. Geneva: World Health Organization, 2017. The increased NCD burden puts a serious pressure on the fragile health systems in most of the low and middle income countries. Major social determinants of NCDs include socioeconomic status, literacy, health infrastructure, social equality and the double challenges from epidemiological transition towards chronic diseases, and rapid demographic transition towards an ageing society. All the determinants are interrelated and largely linked to the political economy to trigger the proximal risk factors leading to the rise in NCDs. Given the complexity of NCDs, to tackle the problem needs to look at the whole system not only the health sector. Conventional reductionist approaches in health policy and planning process are inadequate for tackling complex problems of rapidly increasing burdens of NCDs. Public policy and interventions that fail to take this complexity into account will continue to hinder effective systems response to NCDs. Recognizing that political economy context have critical influence and impacts on NCDs, efforts to strengthen the whole systems might need a new paradigm shift and systems approach. Addressing NCDs with a comprehensive systems approach combine large-scale population interventions through interventions and minimize risk of population to these health risks as key primary preventions (e.g. taxation, laws/regulation, commercial/trade, environmental and urban design, transportation, education, health services, human resources, and etc. to promote healthy life style) and effective individual health services (e.g. early detection of NCDs; hypertension, diabetes detection and clinical management to prevent complication such as stroke, heart diseases etc.). Using systems approaches in response to NCDs requires a dynamic process and holistic view, while different perspectives, interests, and power of different stakeholders are taken into account. It is increasingly recognized that there are special sets of approaches, methods and tools that derive from systems thinking perspectives to help the policy decision-making process and implementation of NCD prevention and control. Through a panel discussion in this plenary session, the panelists will highlight the challenge and impact of political economy to the health system and beyond, examine various innovative systems thinking methods and tools that can help create a more effective policy decision-making of NCD prevention and control and provide examples of how the system with sub-systems and components can respond to the political economy of NCDs. “Governance is the exercise of economic, political and administrative authority to manage a country’s affairs at all levels. It comprises the mechanisms, processes and institutions through which citizens and groups articulate their interests, exercise their legal rights, meet their obligations and mediate their differences.” UNDP. Governance for sustainable human development, UNDP policy document, New York, 1997. NCDs continue to be the single greatest cause of preventable illness, disability and mortality worldwide, with large impacts on productive capacity. They account for more death and disease than all other causes combined. NCDs are not confined to wealthier nations. Nearly 75 percent of NCD deaths – and 82 percent of premature NCD deaths (i.e. those occurring before the age of 70) – occur in low- and middle-income countries (LMICs). Processes such as aging, rapid unplanned urbanization and changing consumption patterns contribute to rising NCD burdens globally. In parallel, underlying social exclusion, marginalization and discrimination create conditions that increase vulnerability to NCDs and reduce access to services, resulting in some populations experiencing NCDs at younger ages and enduring worse outcomes. Differential exposures to the four main behavioural risk factors for NCDs – tobacco use, harmful use of alcohol, physical inactivity and unhealthy diet – as well as rising exposures to environmental risks, especially air pollution, and access to prevention and treatment services are often rooted in public policy choices that span sectors beyond health. The 2011 Political Declaration on the Prevention and Control of NCDs emphasized that addressing NCDs requires whole-of-government and whole-of-society responses. Engagement of different sectors including (but not limited to), agriculture, education, labour, environment, trade, finance, infrastructure, urban planning, is critical. NCDs impact all of these areas, and decisions across these sectors often have a greater bearing on health and well-being than do those in the healthcare sector alone. The 2030 Agenda for Sustainable Development recognizes that current NCD trends and sustainable development cannot coexist. It include a specific target, 3.4, to reduce premature mortality from NCDs by one-third by 2030, as well as target 3.a on strengthening implementation of the WHO Framework Convention on Tobacco Control (WHO FCTC). Progress on NCDs would yield benefits across the SDGs, given the multidimensional relationship between NCDs and poverty, inequalities, climate action and a range of other goals and targets. Links can be made from at least nine SDGs to the NCD target (3.4) which show mutual benefits of achieving policy coherence and aligned programmes across sectors.1 For an effective response, NCDs must be integrated within countries’ development priorities and reflected in their planning frameworks for development, including for achieving the SDGs. This session comes at a time when the evidence on NCDs is stronger than ever. A number of global and regional frameworks already exist to guide multisectoral action on NCDs and their social determinants, most recently the WHO Global Action Plan for the Prevention and Control of NCDs 2013–2020. Appendix 3 was updated in 2017, outlining 88 proven cost-effective interventions with 16 of these deemed ‘best buys’ by the World Health Assembly. Of these, four are clinical interventions and 12 in health or services in the wider policy environment. These frameworks identify enablers for successful multisectoral action on NCDs and health more broadly: high-level political commitment, governance mechanisms to facilitate and coordinate multisectoral responses, and robust structures for monitoring, evaluation and accountability. The Global Coordination Mechanism on Prevention and Control of NCDs (GCM/NCDs) established by the WHO in 2014, contributes to accelerate the achievement of NCD-related SDG targets by fostering high level political commitment and encouraging multi-sectoral and multi-stakeholder engagement at local, national, regional and global levels. Yet, progress on NCDs has been deemed ‘insufficient and highly uneven.’ With the third High Level Meeting on NCDs: Time to Act! in September 2018 to take stock of progress, there is a critical need to scale up approaches and make good on current commitments. There is likewise an urgent need to expand policy and programmatic approaches to NCDs beyond the 4x4 model, to also look more closely at environmental risks, mental health, and road traffic injuries. The Global Programme of Work (GPW 13) in WHO on NCDs is a robust platform to extend attention to mental health. Overcoming policy incoherence and the inability to adequately balance trade-off between different goals (for example economic or commercial interests and NCD targets). Confronting global governance challenges, for example related to trade agreements, and limited investment in South-South cooperation or regional legislative frameworks to address shared concerns. Depending on the context, there may be particular opportunities and challenges related to NCD governance. For example, LMICs often have lower capacities to respond to NCDs and must contend simultaneously with ongoing communicable disease burdens, including from HIV, tuberculosis (TB), malaria and water-borne diseases. In such settings attention to co- and multi-morbidities and co-financing options may be appropriate. Similarly, in places where the burden of NCDs is concentrated in sub-regions or cities, empowering municipal governments with greater authority over public health is integral to building decentralized governance capacity and greater intersectoral competence to deliver and increase uptake of NCD prevention and treatment services. Identification of policies, regulations, structures and partnerships for addressing key governance, financing and accountability challenges in the prevention and control of NCDs. 1 Paper #1, Lancet Task Force on NCDs and Economics, April 2018. Parallel Session 1.1 Addressing the Behavioural Determinants of NCDs: Empowering or Victim-Blaming? Plenary Session 3 Governance of the NCD Response – Who Is in Control? Parallel Session 3.3 What's Law Got to Do with It ? Note: These sessions are subject to be updated.